Cats are aggressive, too, and their aggression should be taken as seriously as canine aggression. Keep in mind that cats have five natural weapons – their sharp teeth and equally sharp claws – at their disposal that can cause severe lacerations, both in animals and humans. The lacerations aren’t just painful but, more worryingly, can become infected quickly and cause cat scratch fever. Indeed, aggression between your pet cats isn’t just a danger for them but also a danger for you and your family. You must then take the necessary measures to prevent it and here’s a good way to start. In animals, aggression is the threatening behavior toward other animals and humans that can become harmful to both the aggressor and the subject of aggression. Most wild animals display aggressive behavior for many reasons including guarding their territory, protecting themselves, and defending their offspring, as well as hunting prey. In domestic cats, aggression can take many forms, too, from hissing to attacking others. If you’re a cat parent, you should learn the basics of cat body language. You will then be able to get a more accurate reading of your cat’s feelings, motivations and reasons for their behaviors and actions including aggression. You can then reduce the incidence of cat-to-cat aggression between your feline babies and enjoy a more peaceful home. Keep in mind that cat body language isn’t as easily observable as dog body language so you have to practice. Feline body language including body postures, carriage and position of the tail, ears and whiskers, and facial expressions so look out for these aspects. Cat experts classify aggressive behavior into two types – offensive and defensive. A cat on the offensive will make himself appear bigger while a cat on the defensive will adopt a self-protective posture to make himself appear smaller. 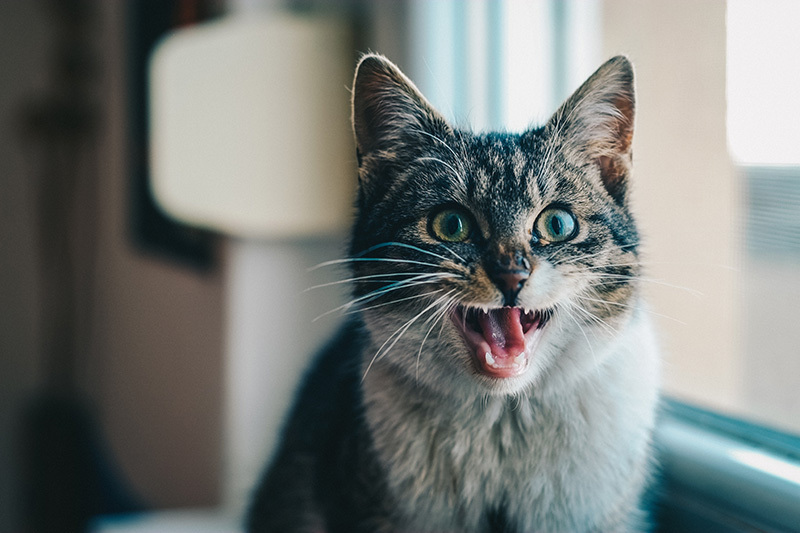 In either case, you should never touch, punish, or even try to reassure an aggressive cat; otherwise, you’re putting yourself at risk of cuts and bites. The offensive postures in an aggressive cat include stiffened rear legs; straight-legged upright stance; stiff tail that can either be held straight down to the ground or lowered; upright ears; constricted pupils; direct stare; and making sounds like growling, yowling or howling. The defensive postures include head tucked in; crouching like hunting prey; tail tucked in or curved around the body; partially or fully dilated pupils; flattened ears or placed backwards on the head; and hackles including the fur at the top raised. Be careful about approaching an overtly aggressive cat, whether he’s in an offensive or defensive position, since you can be bitten and injured. The signs include striking or swatting with paws, biting, growling and shrieking, and scratching. Keep your distance until such time that the aggression has passed. Remember that preventing house fights between your cats isn’t an overnight process. You may spend several months on the process so be patient. You may also consider bringing in a cat trainer for problematic felines. The things that you can do on your own, nonetheless, are aplenty. Give your cats enough territorial space so as to decrease their urge to fight. You can increase their respective space, too, so that they don’t have to share areas for hiding, climbing, and perching; the more aggressive cats share territory in any way, the higher the risk of fights. Give them more toys and cat trees as well as litter boxes and feeding stations. This way, each cat will have more than enough space to enjoy his activities at his preferred pace. Don’t think of it as spoiling your cats but rather of giving them their desired territory, an important aspect for felines in the wild and at home. Install an electronic cat door that can only be opened by the passive cat; the door comes with a collar that acts as a key. The passive cat – or the victim cat, if you will – will then have access to most areas of your home without the aggressor cat attacking him. Avoid giving rewards for aggressive or bad behavior. You shouldn’t give attention and food to calm an aggressive cat since it rewards him, the bully, and reinforces his behavior in the long run. Instead, you can redirect his attention with an interactive toy and make him play. You may also interrupt his poor behavior by using an aerosol hiss and then reinforce his good behavior – when he becomes calm – with a treat or with attention. Use a harness, a leash, or a carrier when exposing their cats to each other or when they are in the same room. The physical control devices should keep them away from each other’s throats. If necessary, consult with a veterinary behaviorist – ask at PetSmart for recommendations – for professional therapy purposes. You may be unable to do it on your own or medication may be necessary. In a way, your cats are like your children. You may be unable to understand as well as you would like but you can be in better control when they exhibit aggressive behavior toward each other.